The trip started at Mark's Mum's (Ann) place at Woodgate. Dave and Tom camped in the back yard while we claimed family connection for the comfort of a bed. On Saturday morning Stan and Jenni arrived in time for morning tea replete with homemade delicacies. 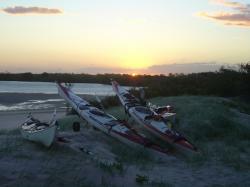 Around midday we drove 300m to launch on the main beach just north of the wooden boat opposite the Woodgate Tavern. It was fairly blustery with a south easterly blowing around 15 knots. 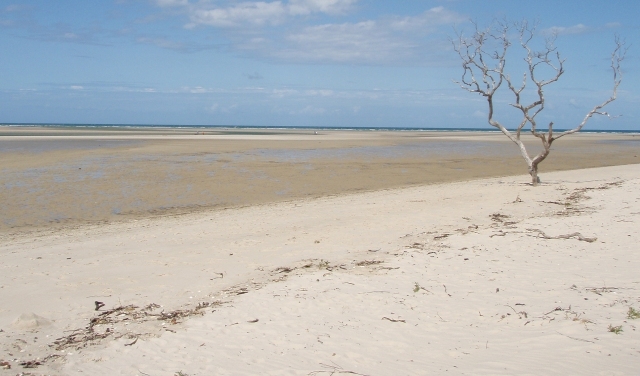 An ebbing tide revealed the relatively flat lower part of the beach which encouraged the swell to roll in rather than dump as it does at high tide. 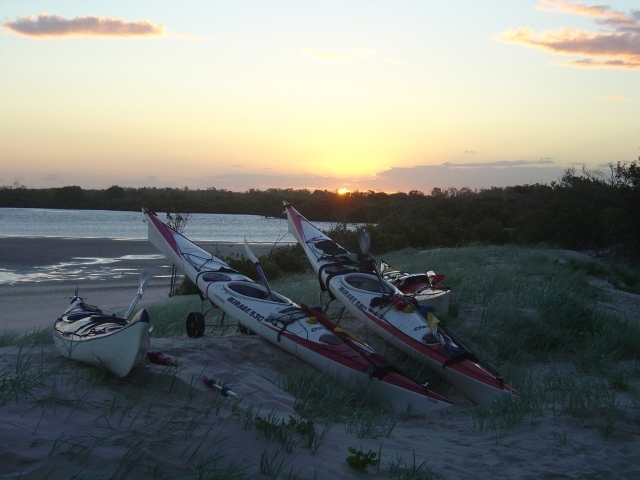 The number of paddlers and kayak carrying capacity meant a car shuffle into Bundaberg with the drivers returning after 3pm. The wind had picked up even more and the tide had turned. The two foot mooring buoy was now disappearing from view in the swell which continued to roll onto the beach. Had it been my decision this is where I would have piked. No one else seemed at all perturbed. Jenni was off first and made it look easy. Ann captured the action on video. Stan was next and almost side by swiped the odd wave but stayed on track. I was shoved off and had a crack at Dave's head with a paddle blade in my anxiety to get off the beach. Tom took his time with each wave. We didn't see much of Mark's effort (maybe it was all a bit much for Ann). Being last, Dave took off without the protection of a skirt and was promptly swamped by four waves. The most used word in the video commentary was 'rough' and as soon as we passed the break zone Ann stopped recording as all she could see was the odd head bobbing up and down and theseheading in different directions. After Dave bailed out, Mark released his rudder we re-grouped and headed north for planned destination of Coonarr. It was slow going. Trying out my bailer as a sea anchor didn't help. After 2.5Km in an hour there was a distinct possibility of running out of light and the decision was taken to land at Theodilite Creek. This meant negotiating 300m of small to medium fairly chaotic surf Stan was last seen riding a decent wave. Three paddlers took a swim. The webbing connecting the pedal to the rudder cable on the Raider broke after landing. 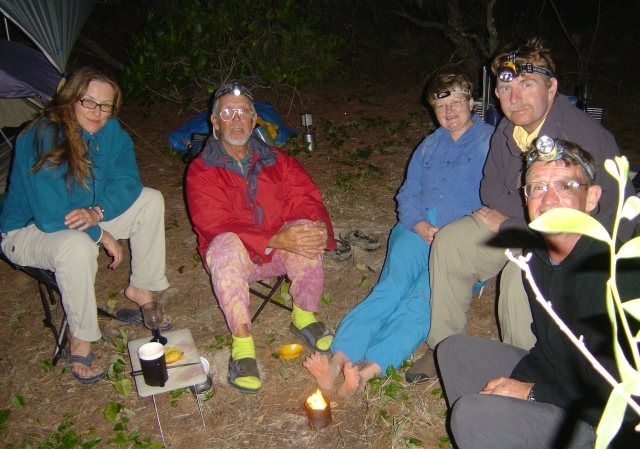 That night we camped behind the dunes in the Kinkuna section of the Burrum Coast National Park. Being accessible by 4WD there was the usual detritus but we were not disturbed by any other people.